This concert is an initiatory journey into music and poetry from the Safavid era of Persian culture. 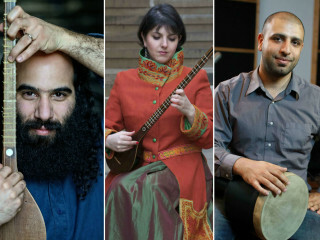 Based on the latest musical researches, Kiya Tabassian, Sepideh Raissadat, and Hamni Honari revisit some of the country's most beautiful musical pieces and rediscovered treasures. This performance sheds light on Persian Magham music (prior to the Dastgâh system) and builds bridges with our contemporary repertoire of Radif. New compositions and improvisations by Kiya Tabassian will also be performed. The poetry of Hafez describing the mystical life inside the gardens will lead the musicians and the audience inside this sophisticated world of Persian Chahar-bagh.